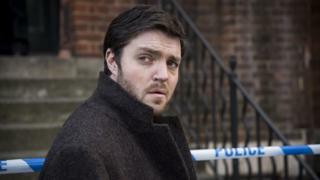 When Tom Burke was cast to star in the BBC series Strike - based on JK Rowling's crime novels - his profile shot up beyond the expectations of those who knew him from other TV roles and an extensive career in the theatre. There's a new Strike in preparation but for now Burke's back on stage in Don Carlos - and this time he's producing too. "It's not that I don't want to," he says. "But my head has been full of Friedrich Schiller (the playwright of Don Carlos) and we've been touring the play with a cast of 13. When you tour you even start to calculate how few pairs of socks you can get away with - so taking a big hardback book would be a problem." "It was a play I'd discussed years ago with (Israeli director) Gadi Roll and I was delighted when Paul Jepson said yes to doing it at the Northcott theatre in Exeter and then we added Southampton and now the Rose, Kingston. If you do Schiller in central London your audience might know it already - but if you're outside London you're probably asking people to try something new. "Creating a touring show of this size has been an incredibly big struggle - for instance we only had a four-week rehearsal for a big play. In that time Gadi pulled it all together but after the first part of the tour you head to another theatre which will have other requirements so it's hard work. I enjoy regional theatre but it's not that we only want to do stuff outside London - probably it will vary project by project." Filming for Lethal White is pencilled in for late 2019 and Burke looks forward to getting back to playing Strike. "Maybe this is there in many great characters but I think key to him is that deep inside he's on the run. In some ways he can be a centred, grounded individual but then you realise he's had an incredibly strange and darkly exotic childhood. All that 'man's man' side to him may be an insulation for some very raw nerve - that's what stirred my curiosity." Viewers may be hoping finally things will stir too between Strike and his former secretary - now business partner - Robin Ellacott, played by Holliday Granger. Burke has no inside track on what may eventually happen. "I suppose it will have to develop in one direction or the other - but the author is so gifted with the slow burn of relationships without ever losing their intensity. When Holly and I have been filming we've found a real nuance there.